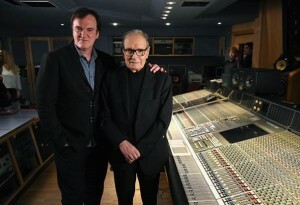 To mark the launch of Quentin Tarantino’s new film The Hateful Eight and its thrilling new score from Ennio Morricone, both artists met for a special event at Abbey Road Studios. 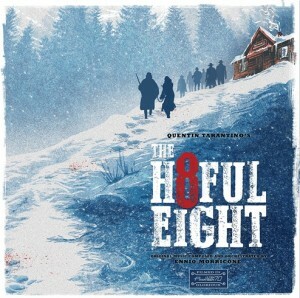 Quentin Tarantino’s The Hateful Eight Original Motion Picture soundtrack features compositions from Ennio Morricone and will be released on December 18, 2015. Tarantino and actors Kurt Russell and Walton Goggins watched as Morricone conducted the Czech National Symphony Orchestra in a live recording of music from The Hateful Eight, cut to vinyl. As a gift to fans, those who pre-order the album will be given the chance to receive one of these hand-stamped, direct-to-vinyl editions through www.thehatefuleightsoundtrack.com, while supplies last. While they were at Abbey Road, Morricone, Tarantino, Russell, Goggins and the orchestra signed the famous wall outside Abbey Road, which had been covered in The Hateful Eight artwork. Just hours later, Morricone’s score for The Hateful Eight was nominated for a Golden Globe in the Best Original Score category. 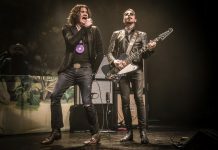 While Tarantino is a lifelong fan of Morricone’s work and has used his music in his past five films, this historic collaboration marks the first time Morricone has recorded original score specifically for one of Tarantino’s films. It is also the first time Morricone has scored a Western film in over 40 years, since the release of The Good, the Bad, and the Ugly. The Hateful Eight film will be released on December 25, 2015, screening exclusively in glorious Ultra Panavision 70 mm film for a limited period and going wide in January 2016. Written and directed by Academy Award-winner Quentin Tarantino, The Hateful Eight is produced by Richard N. Gladstein, Stacey Sher, and Shannon McIntosh. The executive producers are Georgia Kacandes, Harvey Weinstein, and Bob Weinstein.